Radisson Resort at the Port is the closest full-service resort to Port Canaveral, Disney Cruise Lines, Carnival Cruise Lines, Royal Caribbean Cruise Lines, Casino Ships, Deep Sea Fishing and more. We will shuttle you to the cruise ships, saving you the difficulty and expense of parking your car there. Stay in one of our spacious newly renovated rooms, surrounded by our lush landscaping and flowing waterfalls. Choose your luxury from deluxe rooms to our Two-Room Suites. Standard deluxe rooms offer two doubles beds or one king bed and all the amenities you need for the entire family or bathe yourself in luxury with one of our world class Two Room Suites. We offer two cruise packages with your options of room types for your convenience: Park, Cruise & Breakfast includes breakfast for two, shuttle service up to two people per room to and from your cruise terminal, and parking for one car during your cruise Park & Cruise includes shuttle service up to two people per room to and from your cruise terminal and parking for one car during your cruise While you are here, plan to visit Kennedy Space Center. 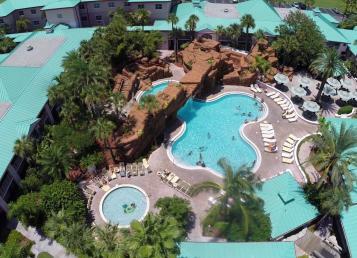 We are also the closest hotel in the Cocoa Beach/Cape Canaveral area. We are a full-service resort at a limited service price—a relaxing and practical addition to enhance your cruise experience. For more information, call (321) 784-0000. Offer based on availability.